The Directory includes a variety of groups and organisations who offer extra support, each in their own way for their own target group, supporting people affected by physical and mental health problems and those who need extra help and encouragement from experienced community music staff and volunteers. All those listed have been in existence for a year or more, and all hope to continue their work in the long term. The Scots Music Group Inspire Project has worked with many individuals, their friends and families, support workers and partner project staff members since 2010. We have often been asked about other music opportunities, and have been very aware of the need to put all the information we have into one place. This Directory is very much a first attempt, and if our plans for the future come together we hope to continue to develop it into a regularly updated resource. Members of the Inspire Choir became our Directory focus group and told us what they would like to see in terms of both content and design. We have also tried as far as possible to follow the guidelines for written material available from the British Dyslexia Association. A limited amount of paper copies are available – contact us if you would like some. It’s available as a digital copy here: Inspire Directory All information is correct as of March 2019, but you should check the dates and times in case they have changed. We hope to develop the Directory in the long term. Contact us if you would like your organisation to be included in the future. 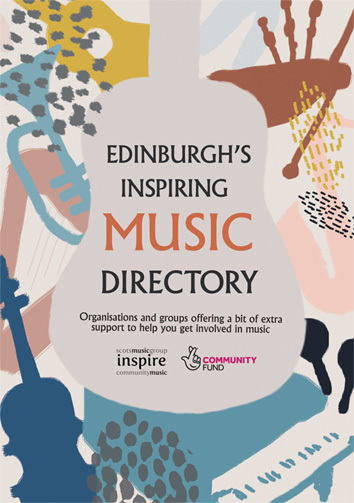 Inspire is part of Scots Music Group, a charity in Edinburgh which organises traditional music classes, informal sessions, ceilidhs and many other community and social events. Click here to visit the main website. Songbook in print and online!